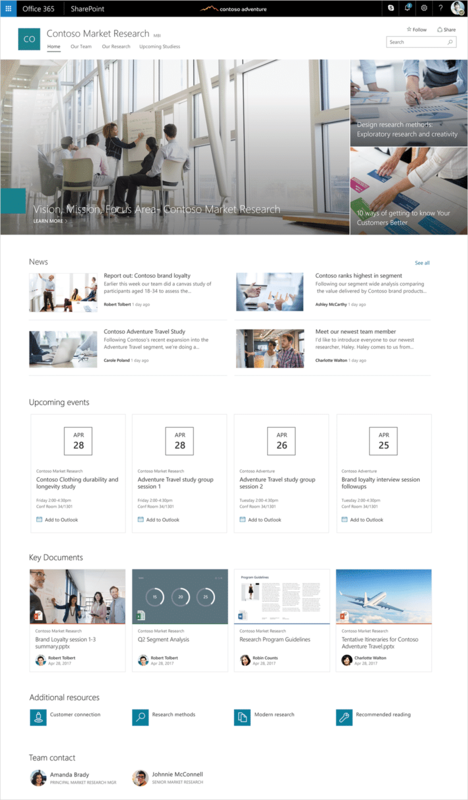 SharePoint communication sites are beautiful, dynamic sites that let you reach a broad internal audience, and that look great on the web, in the SharePoint mobile app, on PC and on Mac. 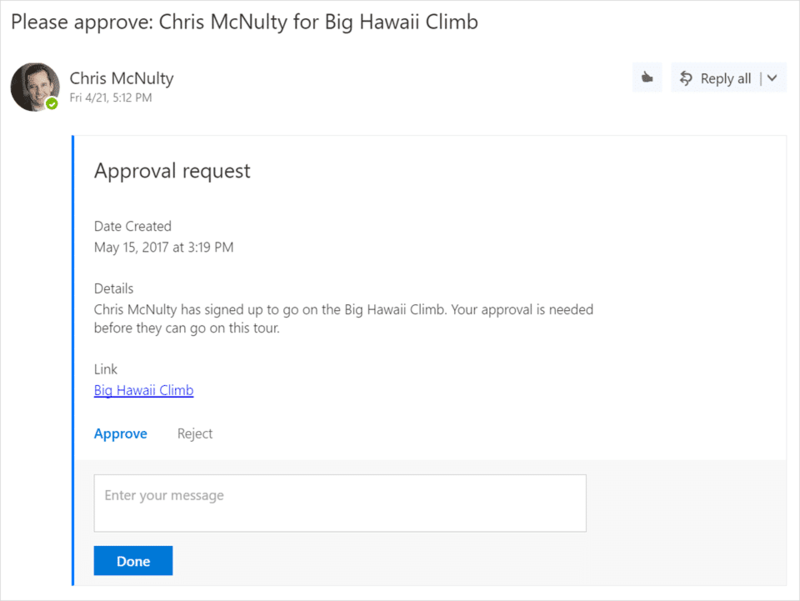 These communication sites are now rolling out to Office 365 First Release customers, followed by full worldwide rollout to Office 365 customers in the coming months. Topic—Select the Topic design when you have a lot of information to share, such as news, events and other content. Showcase—Use the Showcase design to feature a product, team or event using photos or images. Blank—Start with a blank site and make your design come to life quickly and easily. Communication site designs (from left to right): Topic, Showcase and Blank. And it is easy to tell your story. Once your new site is created, simply drag-and-drop to reorganize web parts on the page to bring your use cases and scenarios to life. News and pages allow for multi-column layouts to represent your message in a meaningful, intuitive fashion. Communication sites allow people to create and share recurring updates beyond email. When you create a page on a communication site, you can embed documents and video, and dynamically pull in real-time data from across Office 365, including documents from SharePoint, Power BI reports, Microsoft Stream videos and Yammer discussions. The resulting page is a rich and dynamic communication. And the page persists on the site, so people can refer to it easily, even as the membership of your team changes, so new members can more easily get up to speed. 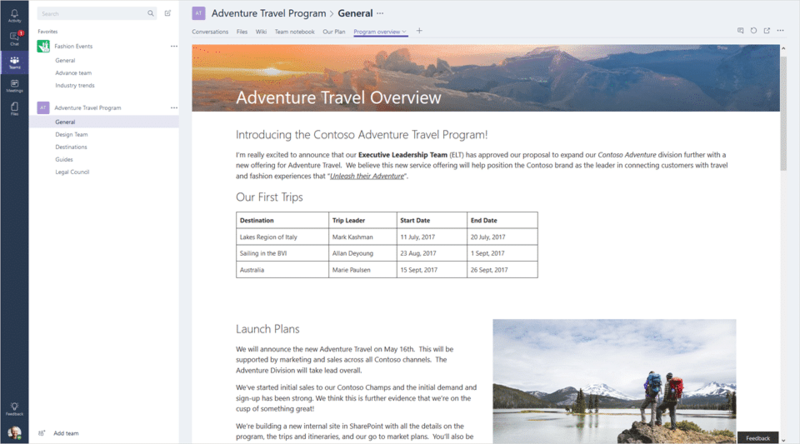 The new capabilities for the rich section layouts and new web parts can be utilized on SharePoint team sites as well. It’s easy to access, engage with and create content for communication sites from any device. The full site, pages, news, navigation, search and more are natively viewable, functional and engaging. 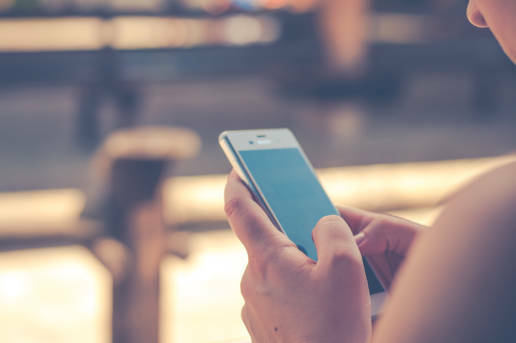 Read a page, create a news article, engage in a Yammer conversation—all in the context of the site—from within the SharePoint mobile app experience. You can download the SharePoint mobiles apps for iOS and Android today, and the new features will be available in the coming weeks. Learn more about the SharePoint mobile app for iOS, SharePoint mobile app for Android and SharePoint app for Windows 10 Mobile. Communication sites have additional capabilities to further refine and enhance your message. Full-width layouts—The Hero and Image web parts can be placed in a section layout that spans the page from left to right, giving you ways to emphasize your most essential information. Enhanced title region with custom header image—Visually represent your home page, news and subpages with a compelling header graphic and title. You control what portion of the image is the most important, so it looks great, and as intended, across web and mobile experiences. Comments on pages—Each news article and page can have its own set of comments. It is possible to use the Yammer web part for broad discussion scenarios as well as targeted responses to engage your viewers on the sole message and content on the page—all keeping within the context of the page. 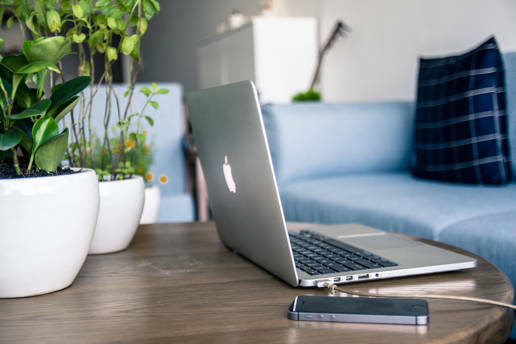 Share news via email—When you share news via email from a communication site, it’s not just a blue link; it’s a visual, informative preview that adds context to both the email and the news article itself. Within the email, the recipient(s) will see a thumbnail, title, description and an optional message from the sender. Power BI and Microsoft Stream—Bring in interactive reports using the Power BI web part, and embed single videos or full channels from Microsoft Stream—the single destination within Office 365 for your cross-company video management. Both Power BI and Microsoft Stream are now generally available. GIF support—When you add an Image web part into a news article or page, you can now include animated GIFs in your layout. New “See all” pages—When there is more content than can be shown within the first view the Highlighted content and Site activity web parts, you can click See all to go to a full-page experience to see all the content and activity. Updated News web part—Showcase your news using multiple layouts to highlight what’s important with greater flexibility. You can use the default Top story layout, view news as a list or side-by-side. Throughout the lifecycle of your projects, launches and internal campaigns, let the SharePoint intranet help you move seamlessly from concept to final product. The powerful, dynamic SharePoint user experiences let you clearly communicate your message throughout your company. As the pace of work accelerates, it’s more important than ever to harness collective knowledge by making it easier to find information and expertise, right when it’s needed, and to encourage best practice sharing. There is now a more personalized search that leverages machine learning and artificial intelligence from Microsoft Graph to surface more relevant and valuable results, faster. When you click in the Search box on SharePoint home in Office 365, recommendations appear instantly. You’ll see recent files, making it easy to get back to your work, as well as relevant content, sites and news. When you’re searching for knowledge, it may be found in content such as files, sites and news. And it might also be found through your colleagues. Now, your search results will include people whose skills, interests and projects—part their Office 365 profile—are relevant to your query. Find what you need faster with instant, personalized results that include files, sites, news and people. Communities built by integrating Yammer and SharePoint encourages people to share content, knowledge and best practices across the organization, by adding a conversational layer to your intranet. 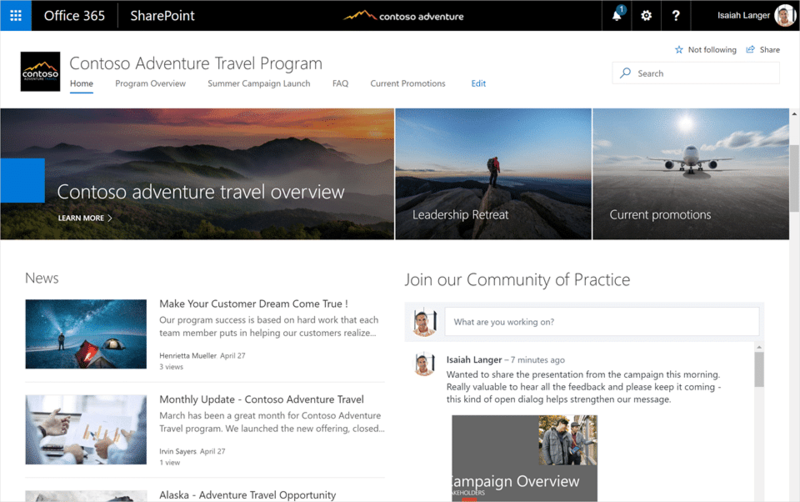 Build a community with shared content and conversation using a SharePoint communication site and Yammer. Innovation in the cloud drives tremendous business value, and it delivers new capabilities to the IT professionals who work tirelessly to support, configure, administer and secure their organizations’ content and services. The new SharePoint admin center, which will begin rolling out in the fourth quarter of 2017 empowers your admins to do more. 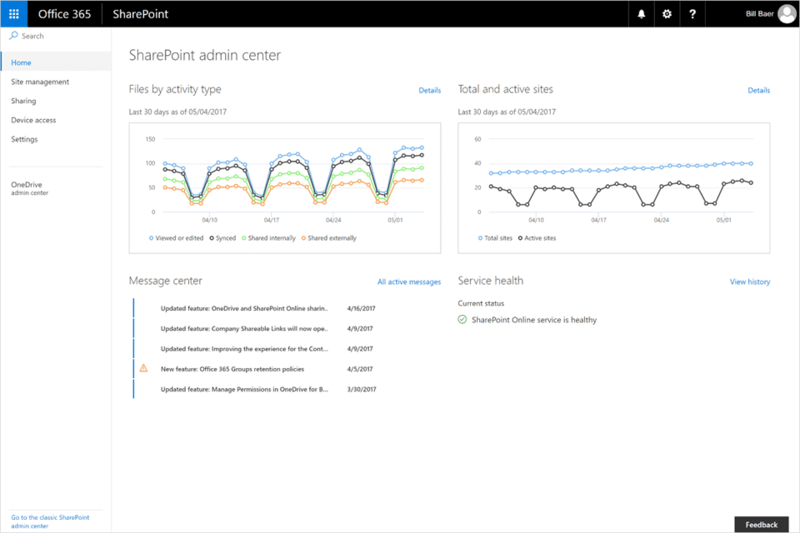 From the homepage, you’ll notice just how much better it is, with interactive usage reports, Message Center posts and a Service Health dashboard tuned to the needs of SharePoint administrators. The new SharePoint admin center surfaces usage, health and administrative messages. You’ll easily find and work with the dozens of SharePoint settings allowing you to configure sharing, access and the service. And we know you’ll love the dynamic new Site Management page, which lets you view, filter and edit the configuration of all of your SharePoint sites—including sites connected to Office 365 Groups. 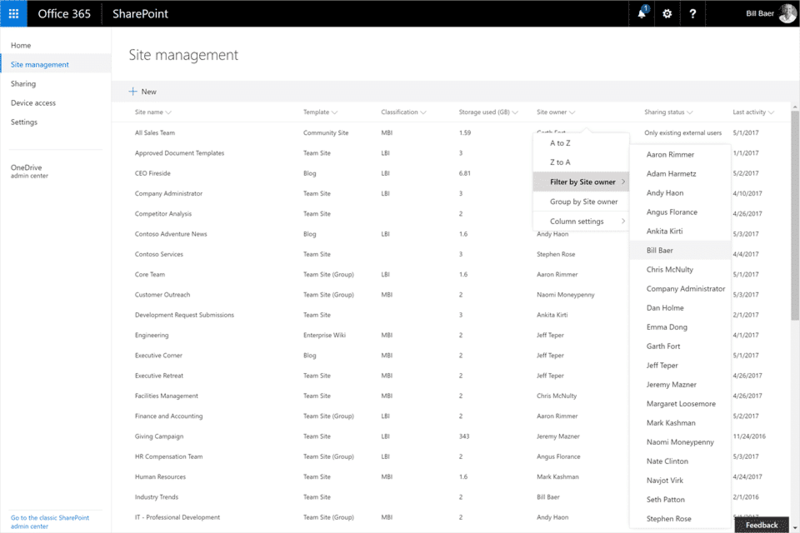 Manage all of your sites in the new SharePoint admin center. To learn more about Yammer integration with SharePoint, read “New in Yammer: Building a More Engaged and Connected Organization” and watch Updates to Yammer: Integrating conversations into your SharePoint experiences. To learn more about SharePoint security and manageability, read “Secure your information with SharePoint and OneDrive” and watch New admin controls for SharePoint and OneDrive for Business. SharePoint and OneDrive in Office 365 empowers individuals, teams and organizations to share with confidence, transform business process, inform and engage the organization, and harness collective knowledge. The features we will talk about in this series will help you to drive these outcomes make it easier than ever for you to accelerate your digital transformation. OneDrive Files On-Demand enables you to work with all your files in Office 365—both work and personal, across OneDrive and SharePoint—right from File Explorer, without having to download them and use storage space on your device. Work with all your files in Office 365 from File Explorer with Files On-Demand. 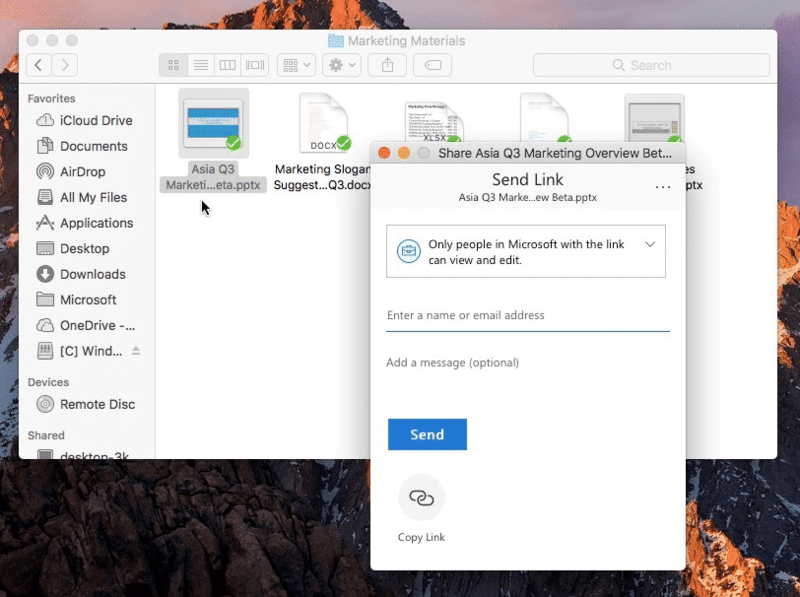 Share Office 365 files directly from File Explorer on PC and Finder on Mac. The sharing experience has been simplified, so you can share a file or folder with specific people or send a link that enables anyone who needs access, inside or outside your organization. In addition, you can now control how long a link provides access, and you can easily view and modify the permissions you have granted. The new sharing experience is the same, whether you share on the web, in Explorer on Windows 10 and Windows 7, or in Finder on Mac. Support for adding SharePoint pages as tabs in Microsoft Teamsso you can add a tab with a news article or your team site’s homepage, for example. This builds upon the existing ability to add tabs for SharePoint document libraries in Teams. Add a SharePoint page to a Teams channel. 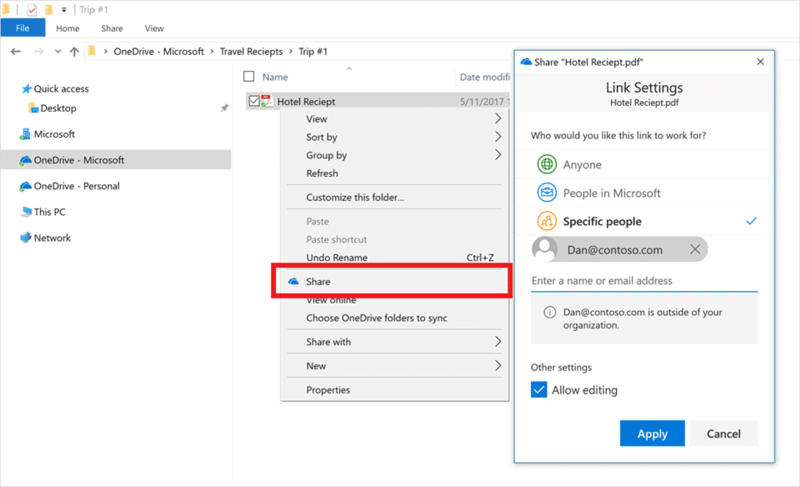 To learn more about these and other announcements for OneDrive, read “New sharing features for OneDrive and SharePoint” and watch OneDrive for Business updates: simplified sharing and files on demand. For more info on SharePoint team sites, read “Personalize team sites in Office 365 and amplify your work using Microsoft Teams and Office 365 Groups” and watch New personalized, focused experiences across your SharePoint team sites. SharePoint Online now holds 1TB site collections, allowing your teams to store more content in a single location. Now you can spend more time sharing your personal work content. 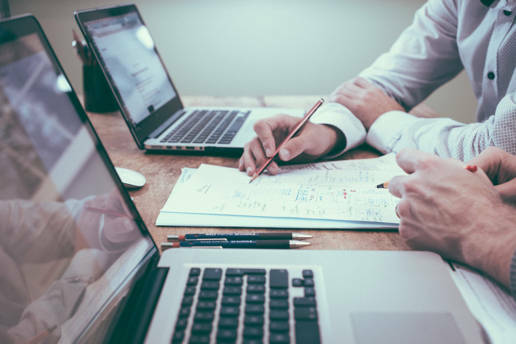 1TB will let you establish large team document centers that teams can use – and keep using over time – without needing to introduce unwarranted information architecture complexities. All your site collections – private and public, managed from the SharePoint Online admin center – can now have up to 1TB of storage allocation. You simply assign the desired amount to the selected site collection. The same holds true for users’ OneDrive for Business that start with a default of 25GB/user allocation. Your SharePoint Online admin can now allocate more storage, up to 1TB, to users in the following increments: 50GB, 100GB, 250GB, 500GB, and 1024GB. 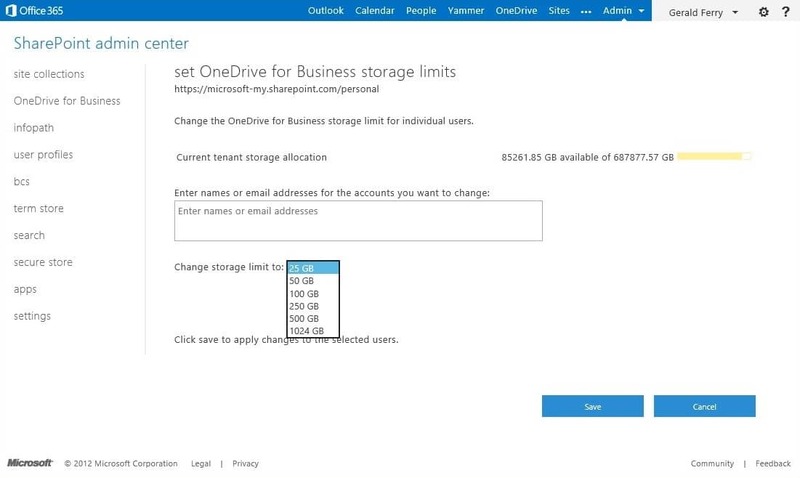 The new storage quota increases limits for OneDrive for Business. Manage allocations in the SharePoint Online admin center. SharePoint Online has seen explosive growth: a 485 percent growth in user access and a 500 percent year over year growth in customer content storage, since April 2013. In the simplest terms, this means customers are leveraging Office 365 more than ever before, both in their OneDrive for Business usage and in collaboration and portal sites. Office 365 and SharePoint Online have architected the storage design to enable infinite storage scale – for current storage needs and unlimited future potential. Users get a default 25GB of OneDrive for Business storage, + 50GB of email storage, + 5GB for each site mailbox you create, + your total available tenant storage, which for every Office 365 business customer starts at 10GB + 500MB times the number of users1. 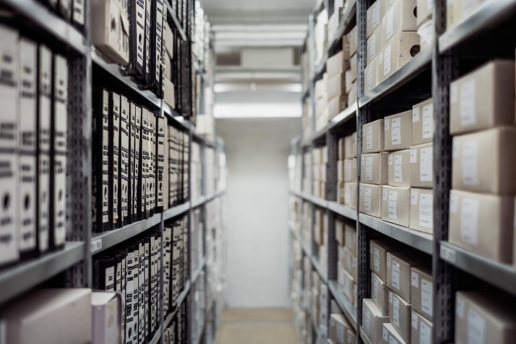 If you and your company have growing storage needs across your various work streams and content types, you’ll find Office 365 offers ample headroom–on day one. And if you need more storage, you can now purchase unlimited additional storage right from within your SharePoint Online admin center at a cost per gigabyte (GB) per month. 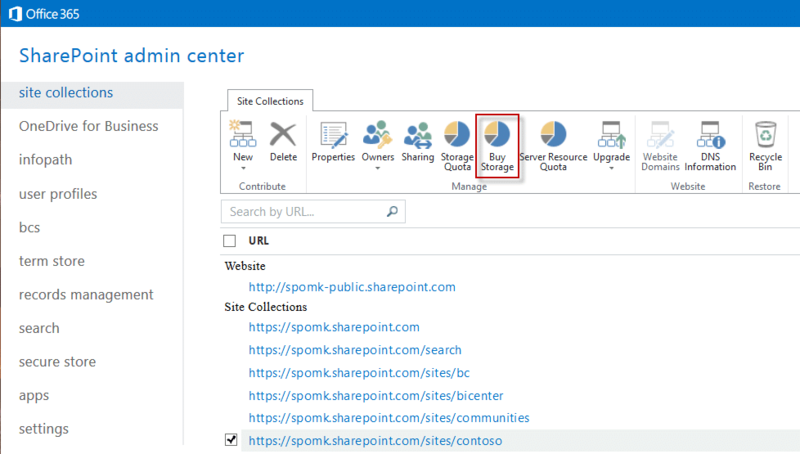 You can click the Buy Storage button from within the SharePoint Online admin center to buy additional storage. Whether you are getting started with SharePoint Online for team collaboration, OneDrive for Business, or your company intranet– know that Microsoft’s cloud is ready for you today, tomorrow, and ultimately for the long-term growth and prosperity of your business. At 6th Street Consulting our SharePoint solutions help you to get more out of each and every work day. Integrated features across applications save time and allow you to focus on efforts that add value and profitability. Set yourself apart and grow your business by sharpening your competitive edge with 6SC.